Salmon Faverolles are the barnyard comedians. They are enthusiastic about everything they do, curious to the point of nosiness and quite talkative! They will always run to you when they see you coming hoping for treats, but even without treats they seem genuinely happy to see you. 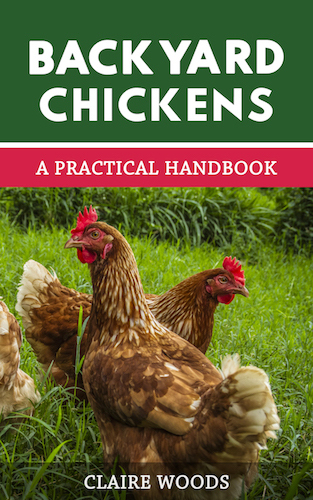 This chicken breed is just about perfect for the homesteader or urban backyard and they are really becoming quite popular now. 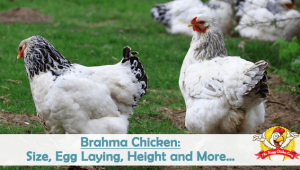 Let’s take a closer look at this breed and see if it’s the right chicken for you. It is entirely possible that other breeds were used too, we will never know for sure since no records exist of the creation of this breed. French farmers were looking for a hen that fleshed out well for market and also laid a good amount of eggs. At that time, the Houdan was the current breed in favor and supplied the Parisian markets with fresh meat and eggs, but the Houdan detested the recent introduction of cage confinement and did not behave well. The farmers were looking for a hen that tolerated caged confinement better than the Houdan. The Faverolles seemed to tolerate confinement very well and did not exhibit any cage induced bad habits like the Houdan did. They were equally at home foraging in the fields – a very accommodating hen. In 1894 the first Faverolles were imported to the UK where the British continued to work with the bird and even set a UK standard for the breed. It wasn’t until the early 1900s when they were imported to the states by a Dr. Phelps of Glen Falls, New York. Where to start? Their beard makes them look adorable with their fluffy faces. The single comb should have five points and is red as is the face; wattles are small to non-existent. The beak is a pinkish/horn color and eyes are a reddish bay. Their body is deep and broad (trapezoid in shape). The back and breast are both wide and there is deepness through the keel. This has the effect of making them look much bigger than they really are. The color of the feathers is a rich honeyed salmon color over the back, head and wings. They have a white/straw colored breast speckled with salmon. Breast, muff and lower half of the body are a much lighter straw/cream color. The under fluff is a grayish color. The feathers are fluffy and loose which also makes them look bigger than they are. 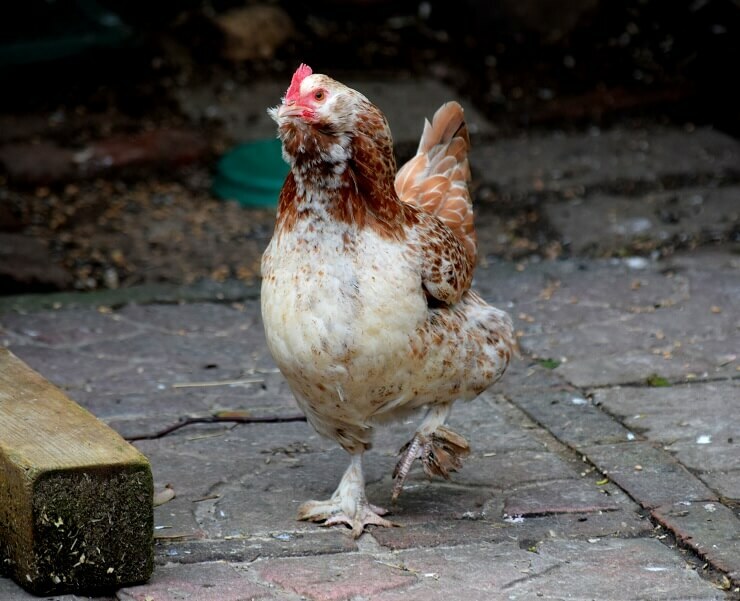 Legs are feathered and each foot has five toes – a genetic present from the Dorking. The legs are white in color as is the skin. The rooster is altogether different from the hen in coloring. He sports a black beard, black undercarriage and a black breast – a magnificent looking bird. He has straw colored hackles, back and saddle. The wing has a rich gold color on the bow, with a triangular white tip. Tail primaries are beetle green and leg feathers are black. ‘Under fluff’ is slate gray. Roosters have a reputation of being calm, non-aggressive and rather regal. 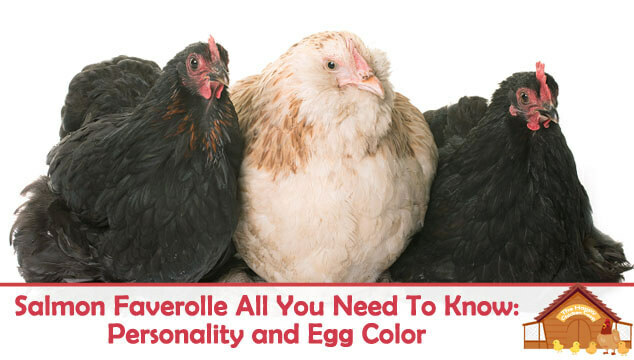 The Faverolles tend to mature a bit earlier than other breed and once they start laying they will lay well through the winter. 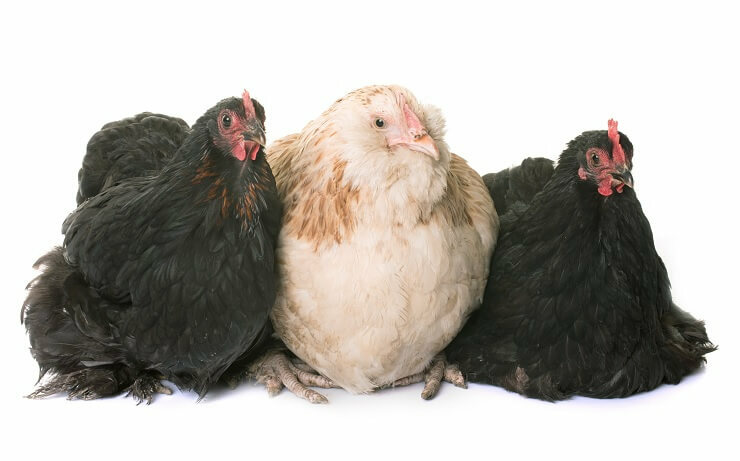 Once mature, a hen will weigh in at 6½lbs; with a rooster weighing 8lbs. Although there are several color varieties available, here in the US only salmon and white are recognized colors. The Salmon color was accepted to the APA in 1914 and the white much later in 1981. The APA classifies this chicken as Continental; whilst the ABA classify it as feather legged and the PCGB classify it as soft feather, heavy. The first bantam Faverolles were created in 1925. Weights for the bantams are males at 30oz, and females at 26oz. Salmon Faverolles are exuberant about life. They are friendly, curious and comical. They will dash wildly around the yard bumping into each other and carry on as if whatever they are doing is of the utmost importance. They are a very cuddly and lovable hen and they enjoy talking with you especially one on one. When I put mine to bed each night (they won’t go on their own, they are spoilt), I chat with them and they chatter back as if they are answering me. Occasionally you will get a grumpy one but that is an exception not the rule. 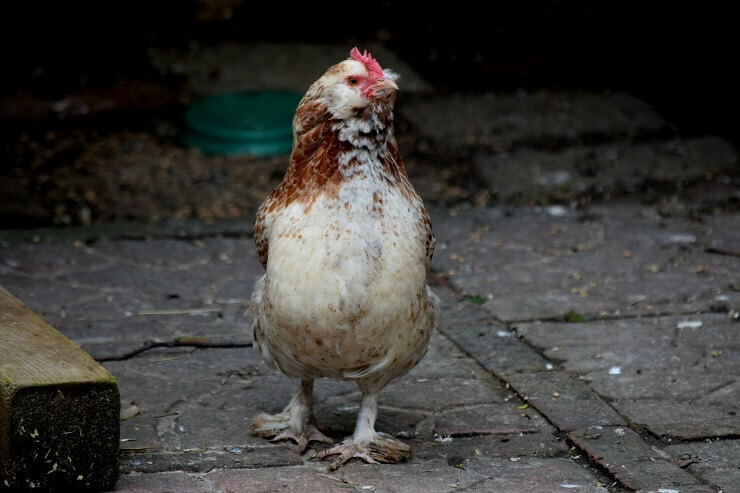 They are a docile and gentle bird and as such do tend to be at or near the bottom of the pecking order, so watch them carefully to make sure they aren’t being bullied by the more assertive hens. As for eggs, they are good layers of tinted/very light brown medium sized eggs. They lay an average of around 180-200 eggs per year/roughly 4 eggs per week. Opinions are divided on the broodiness of this chicken, but from observing my own little flock I would say it’s about average. I have one who goes broody every year, but she is easy to ‘break’. The others are too busy being nosey to care to be broody. Folks who have allowed them to set say they are reliable setters and make good mothers – maybe I’ll try it this year! Their beards and feathered legs are overly prone to lice. You will need to check regularly to make sure your flock does not have an infestation. If you do need to ‘dust’ them be careful around the eyes and beak, the dust can be irritating to both. Feathered legs are also prone to scaly leg mites. The feathers make it very difficult to spot until the problem is noticeable. Again, regular checking should keep things under control. Other than this, the Faverolles seems to be a robust and healthy bird with an expected lifespan of between 5-7 years. Is The Salmon Faverolle Right For You? If you want a hen that makes you smile, loves to cuddle and is great with kids, the Salmon Faverolles may be for you! Their comical antics are sure to bring a smile to your face and if you raise them from chicks they will love to be held and fussed over. This is a very gentle bird that does very well with children, even the roosters are said to be mellow and non-aggressive, although I would not recommend leaving any small child alone with any rooster until you are certain of the temperament. They do not fly well so they really don’t require high fences to keep them enclosed and as we have mentioned they do well in confinement. If they are allowed to free range, they are good foragers and will be pretty happy in a smaller yard, although more space is always better. 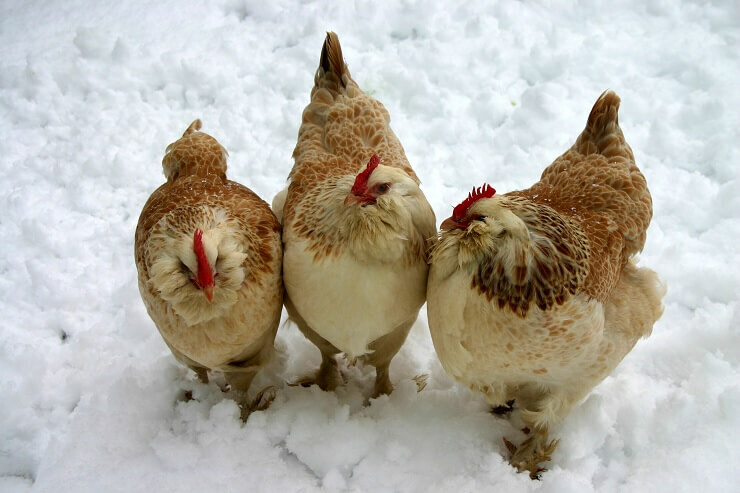 These chickens are good layers and lay well through winter. If you are looking to put food on the table the Faverolles dresses out at a decent weight for a small family. This delightful chicken remains on the Livestock Conservancy ‘threatened’ list. As it is becoming more popular with backyard keepers, perhaps it will move off the list completely. 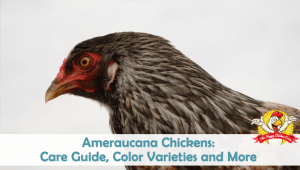 In past years it was kept primarily as an ornamental or exhibition hen, but as more people discover the attributes of this bird it is becoming a backyard favorite again, not only for eggs, but also as a pet. Mine never cease to amuse me. They are always ‘ready to go’ – the first out in the morning and last in at night.